If the title of this post seems a bit strange to you, I think it perfectly encapsulates the type of weekend I’ve just had and, if you persevere and read on, all will become clear-er. I was in London again, thanks to my trusty steed, megabus.com. And it was a scorchingly hot and beautifully sunny couple of days but very much a weekend of two halves. Saturday was Grown-Up Day. I stumbled for a while, walking from Victoria, passing an anti-Capitalist protesters’ camp on the green outside our all-new, historically-different, coalition-inhabited Westminster, where throngs of miserably hot tourists shuffled along and clicked photos at various artistic angles of our great parliament building. It felt very much like swimming against the tide to make it as far as Westminster Bridge, let alone across it, but I made it south of the river and, despite there being equally as many people out and about, there seemed more of an easy-going flow and less of a hectic push-and-shove. And, once in the shade of the South Bank, I sat outside near the elephant in the picture. 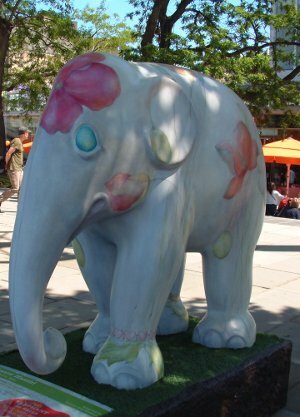 (There are currently 250+ elephants all over London, each decorated differently by an artist or celebrity and all are for sale to raise money for the Elephant Family charity. To find out more, read Elephant Family.) It was wonderful sitting in the midst of the hum of people meeting and chatting and strolling and I made the most of it, people-watching and scribbling for a while, making character sketches and noting snatches of conversation. So, yes, if you were on the South Bank on Saturday, you may be appearing in my writing in some form in the future. Sunday was Kids’ Party Day. Yes, plural. One of my lovely god-daughters and her equally lovely sister have birthdays a month apart so this year they had a joint party. Here’s something I learned this weekend. There is way more to a children’s birthday than jelly and ice-cream and cake and games such as pass-the-parcel or pin-the-tail-on-the-donkey, which is what they seemed to consist of when I was 6 or 7. On Saturday night, I’d earned my bed and board by helping to make up party bags and then, on the day of the party, it was all hands on deck to make sandwiches and homemade dip for the adults, and help youngest Birthday Girl with her story about Robin Hood for school, while the Birthday Girls’ clever Mummy finished off some pretty amazing cupcakes. 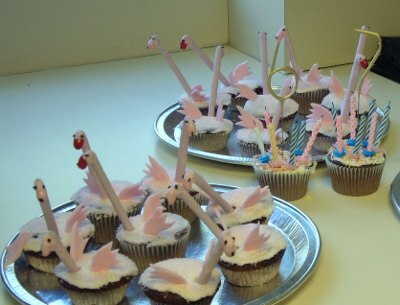 Flamingo cupcakes. And here they are in all their glory (see pic above). Truth be told, although we had to set up the tables, the brilliant children’s entertainer, Ali Do Lali (who is exactly as his name suggests!) pretty much took care of the entire party. He was the best anything I have ever seen at holding the attention of 18 6- and 7-year olds for two hours solid. After the party was over, it was time for me to head back west and this provided an interesting end to my weekend. I arrived at Twickenham train station only to find myself flanked by every flavour of superhero (some decidedly unsavoury), some incredibly butch-looking (wo)men in variations on Ginger Spicesque mini-dresses, Fred Flintstone, a right bunch of bananas, walking flags of various nations and some normal-looking people. I had chanced upon the station at roughly the same time as the entire contents of Twickenham rugby ground, host to the International Rugby Sevens, emptied. It might have looked like a queue but moving forwards sometimes felt like being in the middle of a Guinness World Record ruck-and-maul attempt. After 45 minutes, it spewed me onto the platform and I had nearly cooled down by the time the train arrived. I just about made it to Victoria in time for my coach home but I wouldn’t have missed the singing or the banter or the colour of that moment at Twickenham for anything. It was the perfect end to my weekend. What a weekend! You can’t beat our capital city and it’s probably the biggest thing I miss about the UK, even more than my home county of Suffolk. The part I loved to read the most was about Twickenham. I am a huge rugby fan and used to regularly go to Twickers. There is nothing like it. I sometimes feel sorry for the locals around the stadium, but that said, despite the crowds and litter, I don’t think they get to see much other kind of trouble. The rugby supporting crowd are known to be so friendly. And the train from the station back into central London is a riot, so long as you don’t mind sitting on the knee of a total stranger, of course! I am glad you had a lovely time and of course you had perfect weather for it too. Thanks Jane! It was pretty perfect as weekends go and, being a big rugby fan, it almost felt as if I’d been to the matches, when I fell in with the crowd making their way home. Some were even on my coach, so it was kind of cool that I came back to Wales with rugby supporters – especially as I’d travelled down to London with football fans on Saturday. Like the symmetry of that!